Thanks LOOSELY WOVEN for “ON THE ROAD’ !! 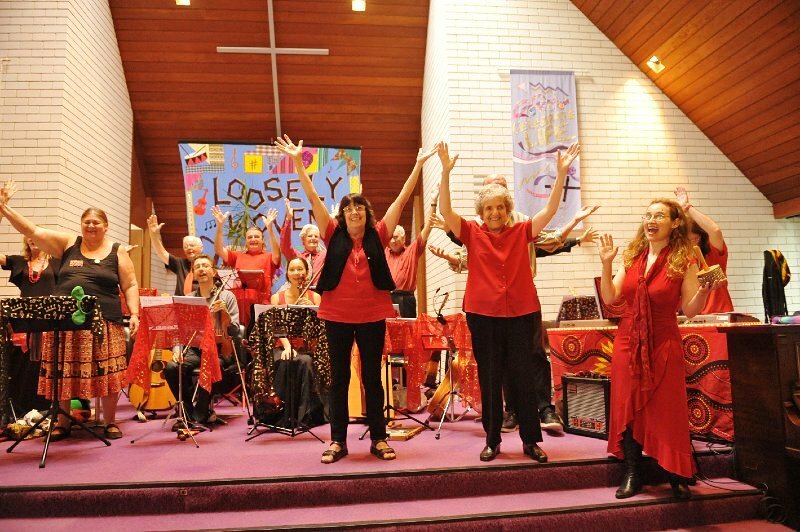 A very enthusiastic audience of nearly 100 applauded the new concert from “ Loosely Woven” which was performed by 22 musicians and singers at Avalon Baptist Peace Church on Saturday (29thMar). “ON THE ROAD ” is the concert that Wayne and Loosely Woven are at present taking to several country towns, and also to Canberra. This quote from the review by Paul Cruise suggests the power of these music makers. They came back like old friends – familiar and reliable. A selection of favourites from Loosely Woven’s most recent shows, “On The Road ’14” provided an opportunity for performers and audience to really ‘inhabit’ these pieces. Topical songs such as John Dengate’s “Privatising Power” only gained potency with a second airing and even Bill Staines’s “A Place In The Choir” had lost none of its appeal. Once again, I was floored by Sonia Bennett’s rendition of her sweet “Bogong Ranges” ( on this occasion literally, for I fell from the stage after invading it to show her my appreciation! ). And in her bluesy “Next Right To Nimbin”, guitarist Greg Thompson and trumpeter Cathy Kirk found a suitably voluptuous groove to ride. Indeed, Cathy and her mother Jan have settled nicely into the fold, subbing very capably for missing members of the ensemble on recorders and piano respectively. 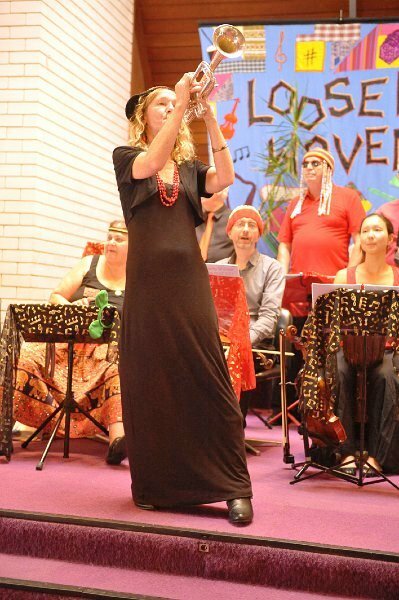 Jan added a lovely xylophone solo to Roy Orbison’s “Crying” while Cathy bossed the hall with her reprise of the Bob Marley charmer “Three Little Birds”. 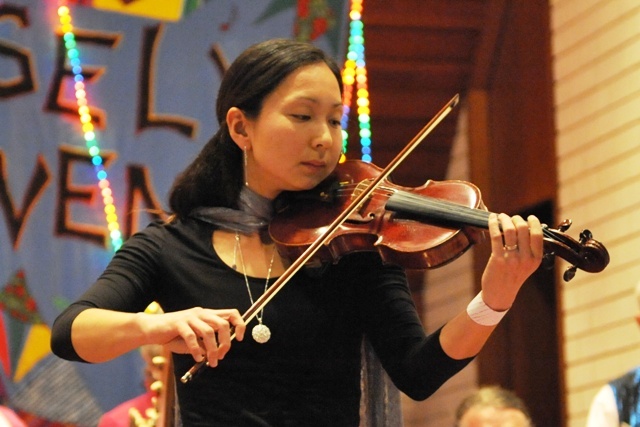 She and Samantha O’Brien made a formidable horn/woodwind section; similarly, violinists Stephen Malloch and Kazu Milne were positively symbiotic on this their first pairing in a Loosely Woven context. As one strand of the fabric told me, ” when you’re involved with music, you organize your activities around it.” To find such dedication in a group comprising mostly amateurs is especially impressive given the ongoing problems with their rehearsal space. Loosely Woven they may be, but they’ve developed into a cohesive, resilient unit which exists purely to delight and edify – now that’s what I call ‘friendship’! 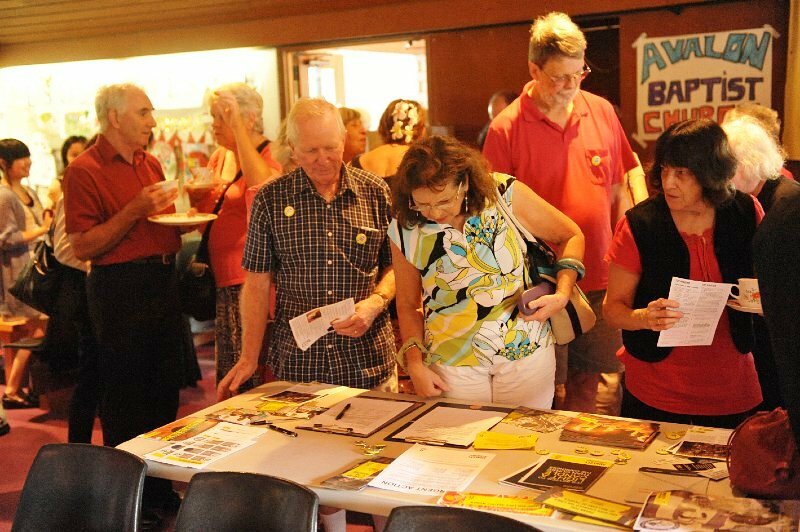 Avalon Amnesty Group were delighted to receive donations to help Amnesty in Human Rights work and signatures on petitions to aid prisoners of conscience in Egypt. Amnesty International thank Avalon Baptist Church for their generous support in hosting Loosely Woven concerts and for the help they thus give Amnesty in the mission of promoting global peace and justice. And we thank the Church also for the hard work and provision of a delicious free lunch for the audience. We also give heartfelt thanks to Wayne and Loosely Woven for their great music, and for their continuing work in raising money to help those who suffer injustice around the world.